and parts under lock and key. 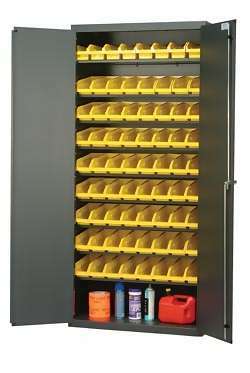 Protect your products under lock and key from theft or shrinkage. safe and secure behind lock and key. Available bin colors: Blue, Yellow, Red, Green, Ivory, and black. Size: 36”W x 18”D x 78”H. Louvered back wall fits (18) QUS 250. 48”W x 24”D x 78”H. 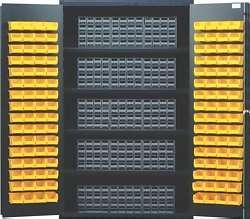 Total of 128 bins and (15) Interlocking Drawer Cabinets. Ship wt. 507 lbs. 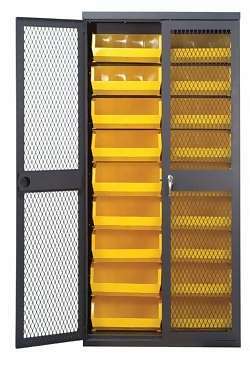 Louvered door fits (128) - QUS 210 bins Shelves hold 15 Interlocking Cabinet Units. Interlocking Drawers available in Gray only.